I always find this time of year difficult, it is hard to top the joy of the holiday season. The cold dark days seem to last forever and winter seems to want to hang on forever. I find this the perfect time of year to be introspective, to take time to figure whether I am still pursuing the goals I set for myself and what I need to do if I have fallen off course. This year is a little different though, I find myself thinking about things that are bigger than me. I usually steer clear of writing about anything political but I have to comment about recent affairs. After the election results from the south of us, almost every day brings with it something a little more outrageous than the day before. The recent news of a travel ban is but one example of all the negative and divisive headlines that have become all too common over the past few weeks. This past weekend I could not escape the news of families that had been re-united but sadly also those that would not be because visas had been revoked. I started to think about my own journey and how my mother brought four children from Africa seeking a better life. I find it incredibly sad that the most powerful nation in the world, the one that so many look to for guidance, the land where dreams come true for so many has now become a nightmare for some. The leader in this country with one stroke of a pen and absolutely no afterthought threw the lives of many into turmoil. He has shattered the dreams of so many and there is no guarantee that all will be fixed. I worry about the future and what is to come, how many more executive orders are going to make headlines? My only hope is that there will be checks and balances that can stop some of the madness. We have seen displays of this with the brave judges who have halted the travel ban and the Attorney General who lost her job because she would not support the ban. Comments Off on INTROSPECTION ShareThis Plugin If You Enjoyed This Post, Click Here to Suscribe to Our Feed! January 2, 2017 | Comments Off on Happy New Year! I love the following quote by Brad Paisley because it is exactly what the beginning of each New Year signifies to me. 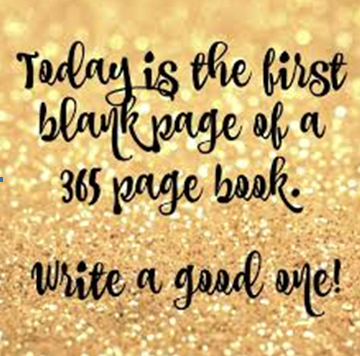 Every New Year is like a blank slate, we are blessed with the opportunity to define what our year is going to look like. We get to decide what is important and what we want to accomplish in the year. My hope for you is that you write that book and fill it with all the things that you want. Let every chapter be filled with your audacious goals; be bold and fearless and don`t let anything stand in your way. It is only in facing our fears that we can ever fully live up to our potential. Have fun writing your book. Comments Off on Happy New Year! ShareThis Plugin If You Enjoyed This Post, Click Here to Suscribe to Our Feed! Let us never forget that there are people in this world who are willing to put their lives on the line so that we can enjoy the freedom we do every day. 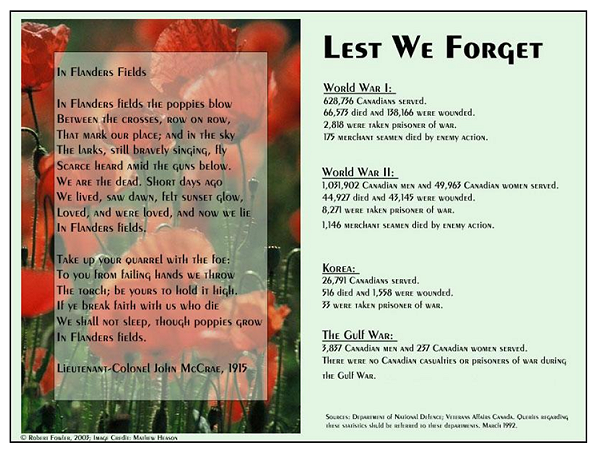 Never take for granted the life we as Canadians enjoy, we have freedoms that millions around the world will never experience, this freedom is owed to our heroes. This Remembrance Day let us salute all our soldiers. Comments Off on Thank You ShareThis Plugin If You Enjoyed This Post, Click Here to Suscribe to Our Feed! I battled with myself as to whether to write today’s blog because it was intended to have been posted on Thanksgiving Day. Unfortunately due to life’s craziness in our household I was unable to deliver. I decided however that it was important to acknowledge my blessings because I am thankful for them every day. My family hosted my in-laws for dinner on Sunday night and we were surprised with my husband’s uncle also showing up. It was a blessed night that only got better when my husband’s brother-in-law and his family showed up for dessert. We had a wonderful evening talking and eating. We watched the Blue Jays sweep the Texas Rangers and then were riveted by the debate between Donald Trump and Hillary Clinton. We watched part of the debate with our children and had a great conversation about what the whole election run in the United States means. The resounding viewpoint from all of us was that we were thankful that our own election run for Prime Minister did not disintegrate to the state that the US election has. In an age when women should be celebrated for their accomplishments and all that they add to our society, it is pathetic that Donald Trump has objectified women in the manner that he has. I think the whole world was dumbfounded by the tapes released last week in which Trump made deplorable comments about women. The sad part of this whole debacle is that although there were those who very quickly denounced Trump, there are still those who stand by him. Even as accusations have started surfacing about his possible predatory behaviour, there are still those who still want to vote for him as their leader. My teenage daughters have asked several times how anybody could still want to vote for him, I have been honest and told them I could not answer that question. As I reflect on this situation, I am thankful to know that most people do not think the same way. I am hopeful that our children (two girls and a boy) will never have to listen to another political figure or anyone for that matter who denigrates women the way that Donald Trump has. Finally I am thankful that women have a voice in the election and anticipate that they will make it clear that they will not put up with the likes of Donald John Trump. Comments Off on Counting My Blessings ShareThis Plugin If You Enjoyed This Post, Click Here to Suscribe to Our Feed! I have said it before and I will say it again, I absolutely love this time of year. The fall for me signifies a new beginning. Although I enjoy summer as much as everybody else does, I am also a creature of habit and getting back to a routine makes me smile (my kids not so much). I am writing this month`s blog in a quiet, relatively clean house, a state it has not been in for two months. Reflecting on this past summer I would have to list the Olympic Games as one of my highlights. Every single athlete has a story and although not everyone walks away with a medal, it is an incredible feat just to make it to the games. My favourite event is the 100 meter race and this year we as Canadians witnessed the race with a vested interest. Andre De Grasse did us all proud, my family and I stood and cheered through the whole race, his silver medal finish was amazing. Preparing for this blog, I started thinking about that race and the stakes that each of the participants faces as they settle into their blocks. Each of them has prepared for years for this moment in time, they have to ensure that everything is perfect in order for them to run their race. A slight misstep could lead to a false start which would mean elimination from the race. I cannot imagine that type of pressure. Fortunately for most of us the goals that we are trying to accomplish do not come down to mere seconds. As I mentioned at the beginning of the blog the fall is like a reset button for me. I am reminded that I have four months to accomplish the goals that I set out for myself at the beginning of the year. I am proud that I have achieved some of those goals such as; taking my children to Uganda and writing my mother’s memoir. I have other goals that I need to focus on and complete before the end of the year and I look forward to tackling each of them. I hope that you still have goals that you are working on, may the next few months give you the time you need to achieve them. If you don’t have any or have accomplished all the ones you set out for yourself, set some new ones and get to work there is still a lot of time left in the year. Comments Off on My Favourite Time of Year ShareThis Plugin If You Enjoyed This Post, Click Here to Suscribe to Our Feed!